The whole Going Down Crew after Dove Canyon. “He’s been down there a long time…” Gab was staring at the rope stretched taut over the cliff. I have to admit I had been snoozing in the afternoon sun. I opened my eyes, the canyons shadow was now at my feet. Nick had been down there a long time. We had been exploratory canyoning in Tasmania since boxing day and were well into our third week. We started with modest expectations. How many good things could there still be left to explore? Even in Tasmania. Haven’t humans gone everywhere? We all canyoned for different reason and for me, the attraction lay in this exploration. Mountains are obvious, rivers are easy to find. But canyons are the last to get explored. Normally skirted by walkers and explorers, there are so many still to be explored. 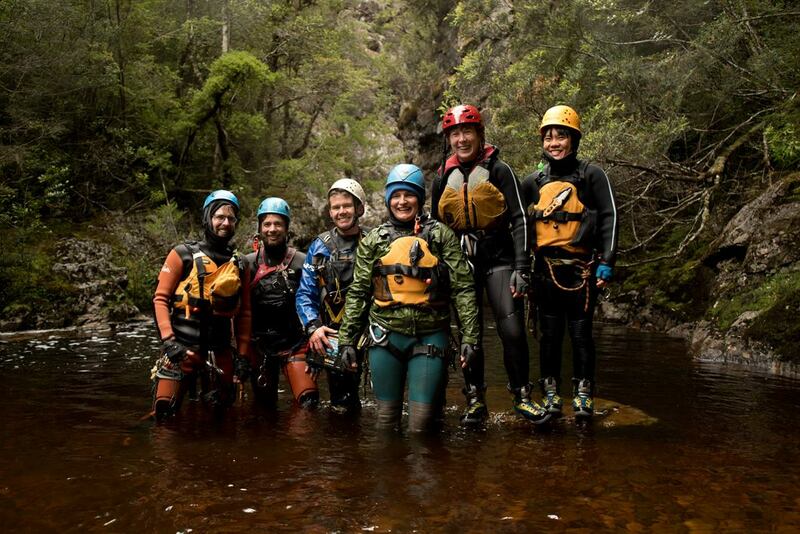 Our first stop was Dove canyon, the only commercially operated canyoning operation in Tasmania. The folks at Dove had provided us with whitewater canyon training. Dove was originally scouted via Helicopter as a potential kayak route and later taken up as a commercial canyoning route. It was fantastic, with features so like a water park it is hard to believe they were naturally occurring. Such A good omen for what we could expect from the area our collective expectatins lifted. Unlike the folks at Dove, we didn’t have a helicopter. Nick hadn’t put it in the proposal. So what we had to find our canyons were maps. 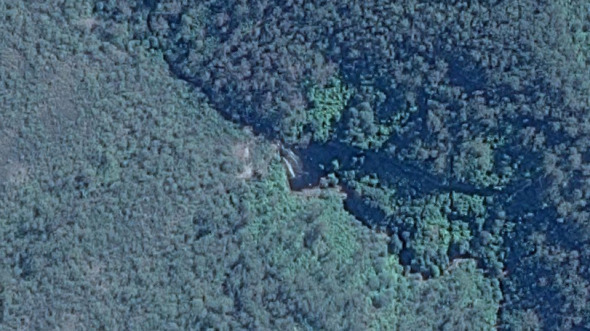 Of the thousands of creeks in the North West of Tasmania, we started focusing on those with marked waterfalls, decent gradient loss, steep canyon walls and easy access. The three L’s of Exploratory canyoning. Exploration, it seems, is like opening Christmas presents. You can pick one up, shake it a little, look at the shape. But until you open it, you just don’t know. To open a canyon you need to get in and make your way down all of it. Only then do you find if it is a picturesque adventure or log choked bush bash. During our time in Tasmania, we got both. As the first group to enter a place there is no book to tell you what equipment you need, how much water there will be nor even whether you can walk to the top of the canyon. Exploration required training, equipment and a lot of sweat for what was sometimes a very small return. We were heading into the unknown. When Nick started his abseil on a 60 meter rope, he didn’t expect the cliff to be over 90 metres. He only found that out when he was, well, literally at the end of his rope. Due to the slope of the cliff wall and the water, he was out of sight and unable to signal to us. The first person to be where he was, dangling over an abyss, this was true exploration. Whether Nick appreciated his fleeting moment of pure exploration or just sunk into hysteria (It should be mentioned that Nick is scared of heights), we will never know. Prusiking back up and penduluming over to a ledge, he was finally able to use the drill he had dutifully carried for weeks. Now all we needed to do was to make sure we could pull down the 60 meter rope he had used to get to the ledge so we could continue. Continue and not spend the night on a cramped, cold ledge. The canyon, which we later dubbed “My special place” was the pick of Canyons for the trip. Its high flow through unusual rock in a dry area made it totally unique. It was an open canyon down a cliff-face overlooking tableland, presenting stunning views all the way down the canyon. There were many beautiful moments and exciting abseils among the three weeks of exploration. In my opinion, there were three new canyons which I would deem to have been “discovered” and that I would be proud to suggest to people. While many others while sharing their beauty were not enough to justify the work to get to them. But our standards were pretty high. On our final day, we geared up to explore one last canyon that Nick’s father had spotted from Google maps. We nicknamed it leviathan. A waterfall so large it could be seen from space. Packing all the things and leaving early, it seemed to be a perfect way to round off our Tasmanian Exploration adventure. Unfortunately that was when the Tasmanian forest fires started. The fires almost surrounded us that day after 40 flared up overnight. They would eventually burn down as much as 11 000 Hectares of World Heritage Area., the majority of which will not grow back. One fire scoured through an area where we had explored two of our three new canyons, and the fate of their rainforests remains unknown. While we’d been excited to be the first to see some areas, we had never thought for a second that we might be the last. Just another reason to get out there and explore.